Notes: Mancinik Castle (Turkish: Mancinik Kale) is a Hellenistic castle ruin in Mersin Province, Turkey.The castle is situated in Silifke district of Mersin Province, at 36�31'N 34�03'E, about 10 kilometres (6.2 mi) bird's flight to Mediterranean Sea. Visitors to the site follow the road from Narlikuyu and Cennet to north . The last 500 metres (1,600 ft) of the course which detaches from the road to east is actually a rough path. 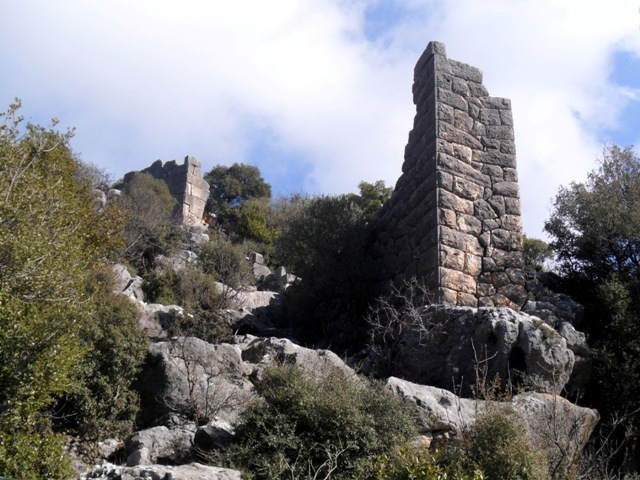 The castle is situated on the clift which overviews the Seytanderesi canyon to the east. Adamkayalar (which is historically unrelated to the castle) is situated 7 km southeast in the east wall of the canyon.The first archaeological research of the site has been carried out by Levent Zoroglu in 1987. The walls are made of polygonal shaped stones, a characteristis of Hellenistic architecture. Also there are few inscriptions. Although these are mostly erased a few words could be read. Hellenistic origin is also confirmed by a decrypted word oikodomos .